"A critical biography far surpassing the previous ones." (Times Higher Education Supplement). "There are to be sure many writers whose biographies are more interesting than their fiction but Hesse is not one of these. He led a long and sometimes eventful life with marital tensions, travel controversy, crises, even some thoughts of suicide and a period of time as a student in a home for retarded and unmanageable. In addition, there was his search which led him through the culture and arts of West and East, his views of politics and society, of psychology and philosophy. The difference between Hesse and other writers is that virtually every shred and patch of his life was brought into his writing, his fiction particularly. 'He had to write about himself and there is little of what he wrote that is not confessional in form and therapeutic in function.' Autobiography is the very matter of his work. Mileck's contribution is to extend and fill out the evidence of his life, his psychoanalysis, his drive toward self-realization which was the very engine of his being, to show the raw material and thus to invite readers to see how it was transmuted, transfigured, fantasized, poeticized, symbolized." (Los Angeles Times). "Hesse was a prolific author for some 60 years, and his mind drew everything it contemplated into his private wars between flesh and spirit. objectivity and subjectivity, the longings for society and isolation. No one is better qualified to disentangle this abundance than Mileck, compiler of the huge two-volume Hesse bibliography. For completeness, then, no biography in English compares." (Kirkus Reviews). "Mileck provides his own translations of the German quotations from Hesse's works, and the eight interpretive chapters are thoroughly indexed, making the work readily accessible to researchers and students concerned with specific Hesse questions and themes. This very readable book also contains a number of exceptional photographs, which, together with Mileck's fervor and understanding of the author, help create a living image of Hesse the man and the artist." (Choice). 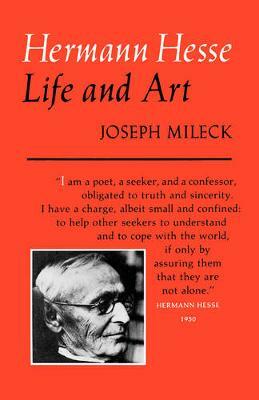 "Professor Mileck ...brings to his task an acquaintanceship with Hesse's published and unpublished writings ...which borders on omniscience. This is a literary biography which concentrates on the works and looks at the life of its subject briefly and always in relation to its involvement with the works ...[This] is true scholarship, which does not make the book less readable and accessible to the general public...a solid and valuable book which should make it easier ...to bring [Hesse] back into the orbit of serious appreciation in the English-speaking world." (Books and Bookmen).